REDUCE, REJUVENATE, REUSE, RECYCLE is a 4Rs concept, a solution to control plastic waste. 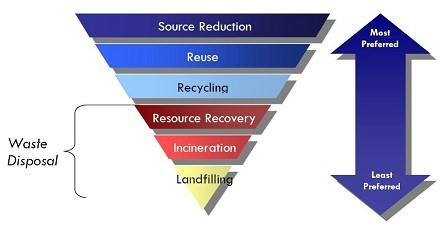 Consider the Solid Waste Management Hierarchy tree. Reduce – At the top of the tree. Reducing our usage of surplus or one-off-use disposable plastic items is one of the largest benefits we can employ, especially at the consumer level. There are literally 1000’s of items used every day that need not be plastic. Currently they are made of plastic as that is the lowest cost method to manufacture these items. When total costs are considered, then making items like drinking straws out of plastic, which have a life of minutes, only to remain for 100’s of years afterwards, should tell us their true cost is a lot higher than the fraction of a cent to manufacture them. Straws made from cardboard or paper are still available, but hardly ever used. If we reduced our use of plastic straws and moved to paper ones, then they would all simply biodegrade away when discarded to a landfill or dropped as litter. Plastic Bags cost the city of San Francisco 17 cents each to handle once discarded. Over the state, California spends about 25 million dollars sending plastic bags to landfill each year, and another 8.5 million dollars to remove littered bags from streets. While a grocer pays next to nothing for plastic bags and gives them to customers at no charge, the follow on cost to all of us is much higher. If customers can be trained to bring in their own reusable bags every time, this will lead to a reduction in one of the major polluting items in our environment. Paper bags are biodegradable and make a good second option, however the giving out of new paper bags every time is still a waste of resources and energy as compared to simply reusing an existing bag. Grocery stores and other retail stores should be actively discouraged from the giving out plastic bags. There are numerous and various incentive systems employed in some cities around the world and forward thinking companies that are effectively reducing their use of plastic bags. Most are simply built around a charge for the bag. As soon as consumers realize they need to pay the real cost of these environmentally damaging items, they will stop expecting or demanding them. The city of Toronto is an example of this. Globally we use approximately one trillion plastic bags a year or 2,000,000 bags a minute. Where can they all possibly go? Plastic Cups. How many of these are thrown away every day? Since the outcries against fast food outlets in the last 20 years, many of them are now using cardboard cups that will biodegrade. However there are still many, many more businesses that give out plastic cups. They are also commonly sold in grocery stores as convenience items as there is no washing nor need to take home if used on a picnic. Disposable plastic cups are simply not needed. Cardboard cups will fill almost all the requirements. Our modern age which encourages buying a “coffee to go” means a plastic lid on every cup. These are both extremely short lived disposable items which will last 100’s of years after their use. Does this make sense? Plastic Bottles. Roughly 50 billion water bottles are produced each year in the USA alone, 200 billion worldwide. This short lived plastic item is worth about $4 billion dollars, and requires approximately 50 million barrels of oil to produce. Typically most end up in our landfills. About 25 percent of bottled water is just tap water that has been packaged by major companies. There are entire Canadian provinces, some other cities or facilities that now understand the environmental damage that plastic drink bottles are causing and have outright banned them. This encourages citizens to go back to drinking fountains again. If the tap water is not drinkable and one must rely on potable water, get a large bottle delivered to home instead of buying 24 packs. Another option is to get a filter installed on the water supply. They are generally low cost. Carry one of the reusable metal water bottles around instead of buying yet another plastic water bottle. Watch this Entertaining Plastic Water Bottle video for a host of reasons why not to be conned into using bottled water. Reuse – Though the volume of plastic reused is small compared to production, it is still a valid method to avoid plastic waste. 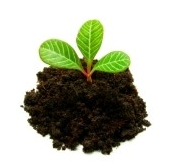 Reuse is simply the act of finding a second (or third, or tenth or hundredth) use for a product to prolong its life. Reuse is an important step after already reducing, but before being ready to recycle. Recycle Recycling is the process of taking a product at the end of its useful life and using all or part of it to make another product. The US EPA estimates that 75 percent of our waste is recyclable, which goes well beyond what is tossed in the recycling bin at home or at school. In 2009 in the USA only 9% of plastic waste was recycled. Low national plastic recycling rates have been attributed to the complexity of sorting and processing, unfavourable economics and consumer confusion about which plastics can actually be recycled. Recycling reduces our waste sent to landfills, and making new products out of recycled ones reduces the amount of energy needed in production. Businesses that sell or offer products in plastic containers should have a recycle bin on their premises for clients to discard the plastic, plus they should arrange for pickups by their local governments or pick up companies. A trip to a highway fast food outlet or hotel will show their trash bins full of drink bottles, plastic cups, breakfast plates as well as cutlery and food containers that were used for just a few minutes then dumped. These businesses do this as it is easier for them to not have to set up a recycle bin and arrange for its collection. But this makes for a large waste of resources, energy and landfill space to simply dump those plastic items to trash each time. Remember they will last for many 100’s of years and become an issue for future generations to deal with at some point. Materials: Additional materials required to mix with recyclate to maintain desired properties. Energy: Reprocessing energy required and fuel energy required for shipping back to the processing centre. RejuvenateThe hierarchy tree shows Reduce at the top as the more preferred way to limit waste production. Below that the Reuse and Recycle options are the next preferred methods to keep items out of the landfill. For products that follow either the Reuse or the Recycle path however, eventually as their useful life expires, they will be bound for the landfill. If plastics had been made with a landfill biodegradable additive at the time of their manufacture, then upon arrival at the landfill, these plastics would then start to biodegrade away down to humus (natural plant fertiliser) and biogas. Hence the concept of the 4th R for Rejuvenate as the ultimate way to reduce the accumulation of plastic waste over the years ahead. It does require the cooperation of manufacturers and plastic formers to agree to add an additive to their products for the sake of caring for the environment. The two main disincentives for manufacturers to do this are a) the extra cost of the additive is an expense they are currently not needing to do so why change and b) businesses have to be cautious when taking risks with new materials as there could be consequences over time that were not able to be tested for, causing the loss of market share or worse. Hence it will be many years before this Rejuvenate concept is readily adopted unfortunately. Energy: Fuel energy required for shipping of materials to landfill. Energy may be able to be claimed back from power generation from landfill.